Want to be notified of new releases in balzer82/Kalman? Situation covered: You drive with your car in a tunnel and the GPS signal is lost. Now the car has to determine, where it is in the tunnel. The only information it has, is the velocity in driving direction. The x and y component of the velocity (x˙ and y˙) can be calculated from the absolute velocity (revolutions of the wheels) and the heading of the vehicle (yaw rate sensor). 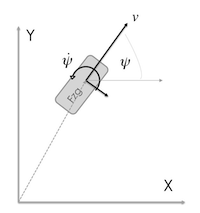 Situation covered: You have an acceleration sensor (in 2D: $\ddot x¨ and y¨) and try to calculate velocity (x˙ and y˙) as well as position (x and y) of a person holding a smartphone in his/her hand. Second example is the same dynamic model but this time you measure the position as well as the acceleration. 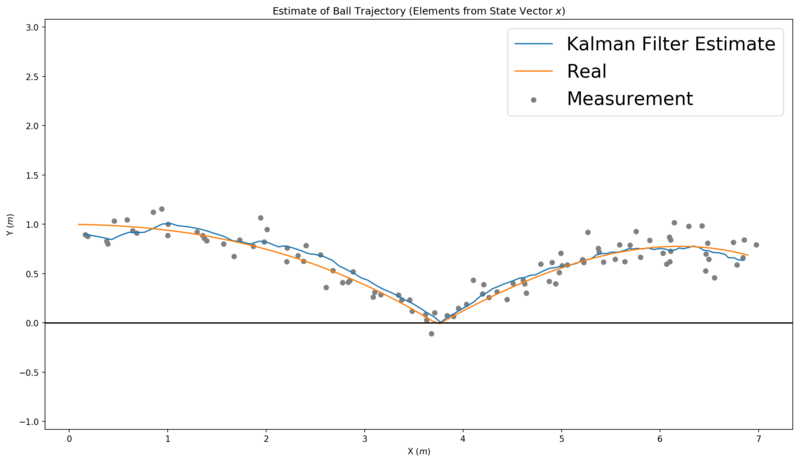 Both values have to be fused together with the Kalman Filter. Situation covered: You have an acceleration sensor (in 2D: x¨ and y¨) and a Position Sensor (e.g. GPS) and try to calculate velocity (x˙ and y˙) as well as position (x and y) of a person holding a smartphone in his/her hand. Third example is in 3D space, so the state vector is 9D. This model is for ball tracking or something else in 3D space. 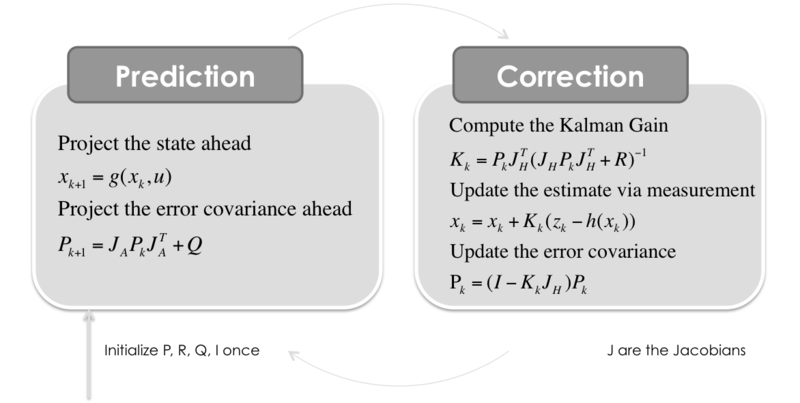 Here the Measurement Covariance Matrix R is calculated dynamically via the maximum likelihood of the acutal standard deviation of the last measurements. Also know as the Gimbal Stabilization problem: You can measure the rotationrate, but need some validation for the correct lean angle from time to time, because simply an integration of the rotationrate adds up a lot of noise. There comes the vertical acceleration, which is a pretty good estimator for the angle in static situations. 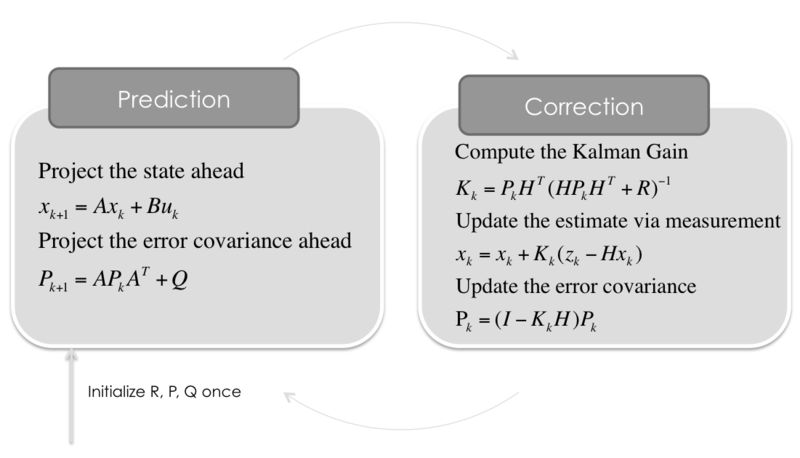 This Kalman Filter implementation fuses both together with some adaptive components. Situation covered: You have an velocity sensor which measures the vehicle speed (v) in heading direction (ψ) and a yaw rate sensor (ψ˙) which both have to fused with the position (x & y) from a GPS sensor. Situation covered: You have the position (x & y) from a GPS sensor and extimating the heading direction (ψ) and the velocity (v). Situation covered: You have an acceleration and velocity sensor which measures the vehicle longitudinal acceleration and speed (v) in heading direction (ψ) and a yaw rate sensor (ψ˙) which all have to fused with the position (x & y) from a GPS sensor.